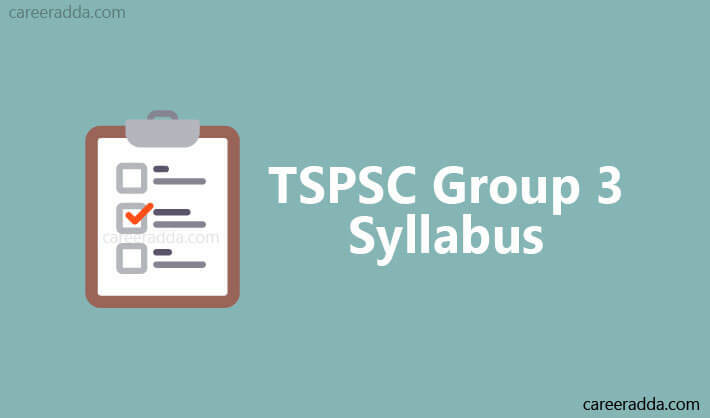 TSPSC Group 3 Syllabus 2019 & Exam Date : TSPSC Group 3 exam pattern released by Telangana State Public Service Commission will help candidates in exam preparation for the posts of Group 3. TSPSC will conduct the recruitment exam for Group 3 positions. There are many candidates who aspire and apply for Group 3 position. It is time to take forward preparation for the TSPSC Recruitment exam. It is important for the candidates to start the preparation as the competition will be tough due to a large number of applicants. So, candidates must take the preparation seriously. To start the preparation, it is important for the candidates to know the exam pattern. Further, they must have in-depth knowledge of syllabus for TSPSC Group 3 Recruitment exam. To clear the recruitment entrance exam of Telangana Group 3, the candidate must gather the information regarding exam pattern and syllabus. The syllabus will help the candidate in familiarizing with the topics. The exam pattern will help about paper pattern, how many questions will form part of the exam paper etc. They will also get to know about the duration of the exam which they will get in the exam to solve the questions. So, one need to prepare hard, to get good marks in the recruitment exam. Good preparation will surely help the candidate in passing the exam. From the starting of the preparation, make notes, further try to solve last year’s question paper to score better. Keep yourself updated from current happenings around the world and in the country. TSPSC Group 3 written exam pattern will help you in getting familiar with the exam. There will be three papers with objective type questions in the test. Each paper will have 150 questions with each question carrying one mark. It means that the total mark will be 450 and for each paper candidates will get 150 minutes to complete. TSPSC Group 3 syllabus will have subjects and topics which a candidate need to study during the preparation of exam. Issues: Inequality and Exclusion: Casteism, Regionalism, Communalism, Child Labour, Human Trafficking, Violence against Women, Disability and Aged. Economy and Development of Telangana : Telangana Economy in undivided Andhra Pradesh (1956-2014)- Finances (Bhargava, Lalit, Wanchu Committees), Deprivations Water (Bachavat Committee) and Employment (Girgilan Committee, Jai Bharat Committee) and Under Development. Indian Economy : Issues and challenges, Growth and Development – Concepts of Growth and Development, Relationship between Growth and Development. Agriculture and Allied Sectors : Agricultural credit, Distribution of land holdings, Share of Agriculture and Allied sectors in GSDP, Irrigation- Sources of Irrigation, Dependence on Agriculture, Problems of Dry land Agriculture. Industry and Service Sectors : Industrial Infrastructure, Structure and Growth of Industry sector, Industrial Development, Micro, Small and Medium Enterprises (MSME) Sector. Land Reforms in Telangana : Tenancy Reforms, Land alienation in Scheduled Areas, Land ceiling, Abolition of Intermediaries: Zamindari, Jagirdari and Inamdari. Till now, no exam date has been released by the authorities of TSPSC. But soon the officials will release Group 3 date of the exam. In order to get selected, the candidate needs to appear in the recruitment exam. After the completion of TSPSC Group 3 Exam, officials will release the result. Now, candidates will get selected on the basis of merit. For some positions, there will be a computer skill test. Candidates shortlisted from these two tests will be called for the document verification. Final selection will be done by the commission after the verification of documents. Q. How Can I Prepare For Current Affairs For TSPSC Group 3 Recruitment Exam? A. You must read the newspaper and magazines on regular basis. It will help you in gathering all the happenings of the world.